Turns out there are indeed a few things that Amazon Alexa just doesn’t know, and one of them is the comparative fitness of one Kevin Hart. 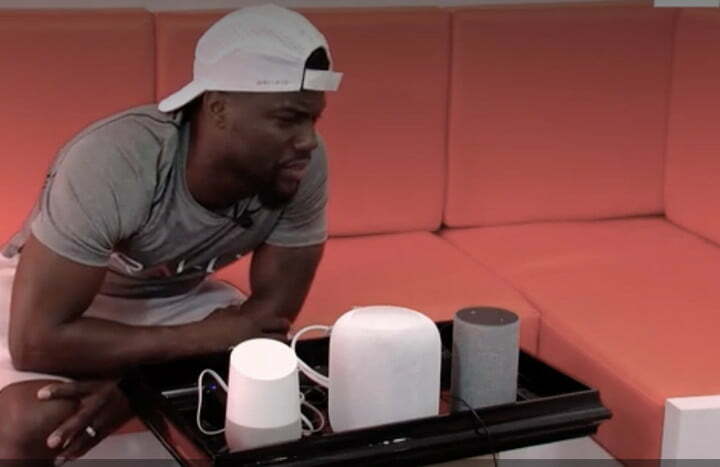 The comedian sat down with three popular smart home devices — an Amazon Echo, Google Home, and Apple HomePod — for an episode of the Men’s Health show, Man vs. Machine. Unfortunately for the actor, his questions didn’t always meet with the most complimentary responses. Hart directs the vast majority of his questions to Alexa (which may have been part of the problem). While both Google Assistant and Siri were standing by and ready to offer their opinions, Hart seemed less interested in their thoughts, only directing one inquiry to Assistant (and none at all to the HomePod — Apple, take notes). When Hart asked, “Alexa, who is in better shape: Kevin Hart or The Rock?” Alexa drew a blank. The artificial intelligence-based assistant responded, “Sorry, I’m not sure,” much to Hart’s chagrin. Her response did not vary when the fitness enthusiast attempted a different tack for the question, asking, “Alexa, who is the fittest: Kevin Hart or The Rock?” A real bummer. Of course, the two-minute segment was not entirely dedicated to discovering how Hart’s fitness levels stack up against his Central Intelligence co-star. The actor also took the opportunity to highlight the importance of a healthy lifestyle and got some help driving this point home from Google Assistant. The smart helper pointed out that eating healthfully and maintaining an exercise regimen helps humans cope with stress and illness. For Hart, maintaining high fitness levels has long been a top priority. The comedian is known for running 5Ks and other races with large groups and has even been featured on the covers of Men’s Fitness and Runner’s World. But even these photo shoots haven’t been enough to convince Alexa that between Hart and The Rock, the former is the fittest of them all. Published on Fri, 13 Jul 2018 19:19:14 GMT, © All rights reserved by the publisher.